Prototype: German Railroad, Inc. DB AG class 640 LINT 27 diesel commuter service powered rail car, DB Regio Business Area. Model: The powered rail car has controlled high-efficiency propulsion, an mfx digital decoder, and factory-installed controllable sound functions. 2 axles powered. Traction tires. The triple headlights change over with the direction of travel, will work in conventional operation, and can be controlled digitally. Maintenance-free, warm white LEDs are used for the lighting. There is a representation of the center buffer coupler at both ends of the train. The train has tinted windows and low-level entries. Total length 28.8 cm / 11-3/8". Contents: 12 no. 24130 curved track, 4 no. 24188 straight track, 1 base station, 7 no. 24172 straight track, 2 no. 24224 curved track, and 1 pair of 24611 and 24612 turnouts. A switched mode power pack and a wireless infrared controller are included. This set can be expanded with the C Track extension sets and with the entire C Track program. The 74492 electric turnout mechanism can be installed in the turnouts. Completely new tooling for the LINT 27. Powered rail car with built-in mfx decoder and sound functions. The ideal way to get started for new people to model railroading, including adults. 29641 – "Modern Commuter Service" Starter Set DB AG Class 640 (LINT 27) 36641 – HLB LINT 27 Diesel Powered Commuter Rail Car With the LINT (= Leichter Innovativer Nahverkehrs-Triebwagen / Lightweight Innovative Commuter Service Powered Rail Car) Alstom LHB, Inc. emerged relatively late on the stage of builders of regional powered rail cars. Four variants are currently being marketed internationally under the label "Coradia LINT": The LINT 27 is a one-part, four-axle powered rail car, while LINT 41 six-axle and two-axle versions are coming along. The LINT 54 is being offered with eight axles as a two-part unit but with longer car bodies. It can be expanded to the LINT 81 by inserting another motored center car. The number behind the name in each case gives the approximate train length in meters. 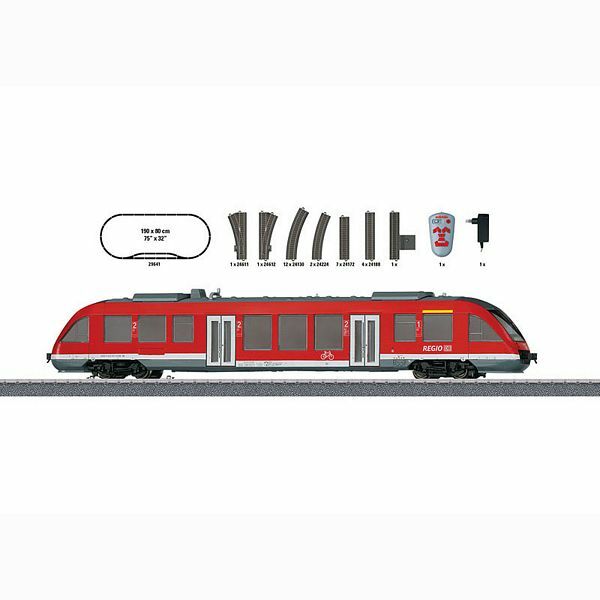 The design of the LINT is set up modular fashion based on the criteria of modern locomotive and car construction so that adjustments can be done at any time to meet customer wishes. On the underbody, welded reinforced steel shapes are used at the ends of the cars. The car bodies are constructed as "warp resistant tubes" mostly of non-rusting types of steel using welded lightweight steel fabrication methods. Fiberglass-reinforced plastic parts bolted and cemented under the end of the car provide a reinforced steel construction for the required safety. A combination rubber-air suspension ensures the required riding comfort. The heart of the drive system is a 6-cylinder diesel motor from MTU with 315 kilowatts / 422 horsepower output. A hydrodynamic Voith fluid transmission transfers the motor power to the two driving wheel sets in the truck. To date in 2000/2001 the DB has placed 30 units of the LINT 27 into service as the class 640. As the first private railroad in Germany "vectus" ordered another ten units (VT 201-210) at the end of 2004 for use on the Lahntal Line as well as the Unterwesterwald Line and the Oberwesterwald Line. In 2005, the Veolia subsidiary HEX (Harz-Elbe-Express) put seven LINT 27 as road numbers VT 870-876 into operation for service on the lines Halberstadt – Blankenburg and Konnern – Bernburg (Saale). After winning the bidding for the 3Lander Line (connections in the Three States Corner of Germany between Rhineland-Palatinate, Hesse, and North Rhine-Westphalia) in December of 2014, the Hessian State Railroad (HLB) took over the LINT 27 units from "Vectus", gradually modernized them, and had them painted in the HLB colors.